Most engagements are between 12-14 months long, so you may only have one Valentine’s Day to celebrate it while you are engaged. Why not make this Valentine’s Day extra special with your sweetie! He doesn’t have to get down on one knee again, but you two could return to the special spot he popped the question. If you are unable to go back to the very spot, you can reflect over how magical the moment was over a romantic dinner! Maybe you two always went to dinner and a movie when you two were dating. Try starting new traditions with each other that you two can carry into the marriage! Don’t focus on extravagance this Valentine’s Day, you have a wedding to plan! Keep the fancy stuff for next year! 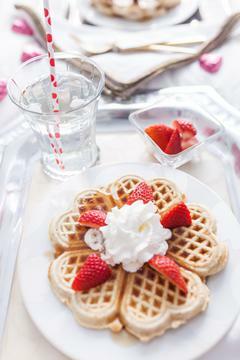 Have a nice quiet evening at home, or start the day with a romantic breakfast! Absolutely no wedding planning! That means no crafts, no guest count talk…nothing! Take the day to enjoy each other’s company and remember why you two are together in the first place!